she wears flowers: Yellow Car! My girls play a car game that I both love and hate. It's called "Yellow Car" and the object is to spot and count the yellow cars that you see while driving from one place to another. (2) School busses don't count. (4) Game starts over every time you get back into the car and go somewhere else. (5) No trying to play when we aren't in the car. We have had various scream fests discussions about whether or not certain vehicles count and if you can really count the yellow truck on our street that is ALWAYS parked in the same spot or other really-don't-matter details. In the end, the winner is the person who has the most yellow cars when we reach our destination. This game is an easy way to distract children from those days when you run several errands and have to be in and out of the car a lot. My two-year-old loves this game, but always loses count of how many cars she has called. She usually just sticks with the number two. I thought I would make the game a little more tactile and educational for the little people who like to play. And, it just may help my older girls to stop cheating forgetting what number they were on! The instructions are long, but this is pretty easy! 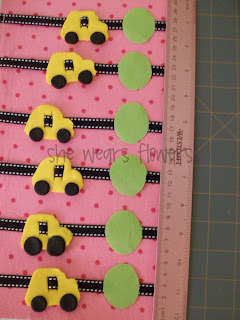 CARS: Make a set of 6 cars. I used Fimo clay which is baked. The finished product is firm, but a little flexible--not brittle at all and the colors are fantastic. I used a play-do cutter for the basic shape and tweaked it as I went along. Every car is a bit different. 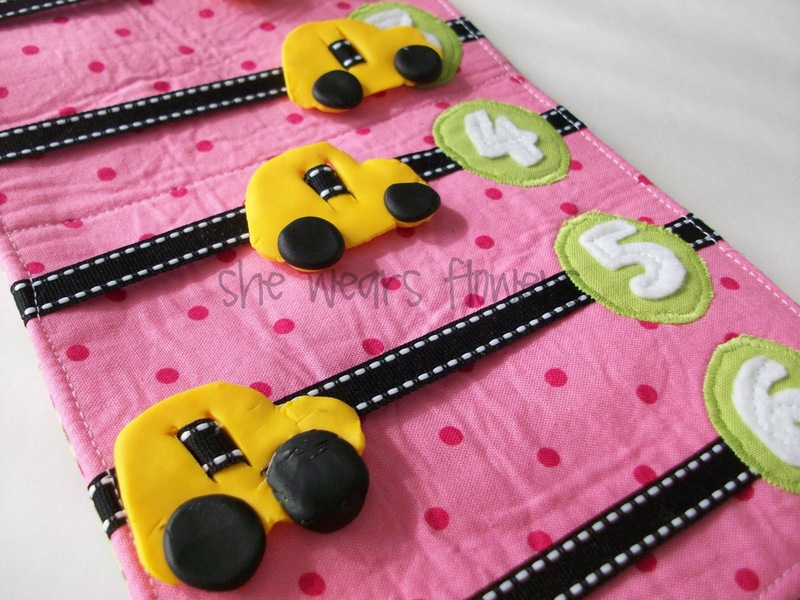 You will need to cut two vertical slits in the middle of your car shape before it is baked. This is where you will weave the ribbon through the shape. Be sure the slits are tall enough to accommodate the width of your ribbon and thick enough to be able to weave the ribbon through the slits. 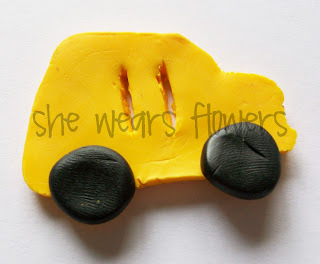 Follow the instructions for your clay to bake your cars and let cool completely. 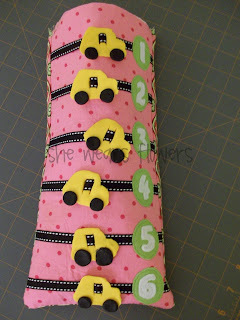 A note--you can use felt, fabric, or foam for these cars, but I wanted them to be chunky so a young child with developing fine motor skills could actually grasp them and slide them along the ribbon. You can, obviously, tailor this to meet your needs. 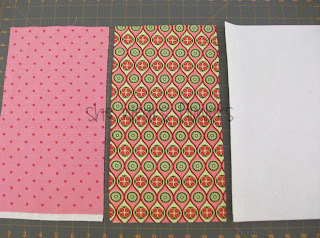 PREPARE FABRIC: Cut two pieces of fabric and one piece of stiff fusible interfacing 7 inches wide by 13 inches long. 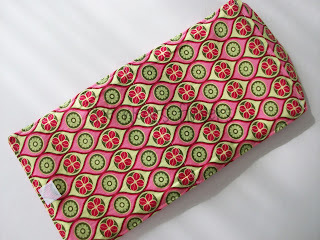 One piece of fabric will be the outside and one will be the inside. 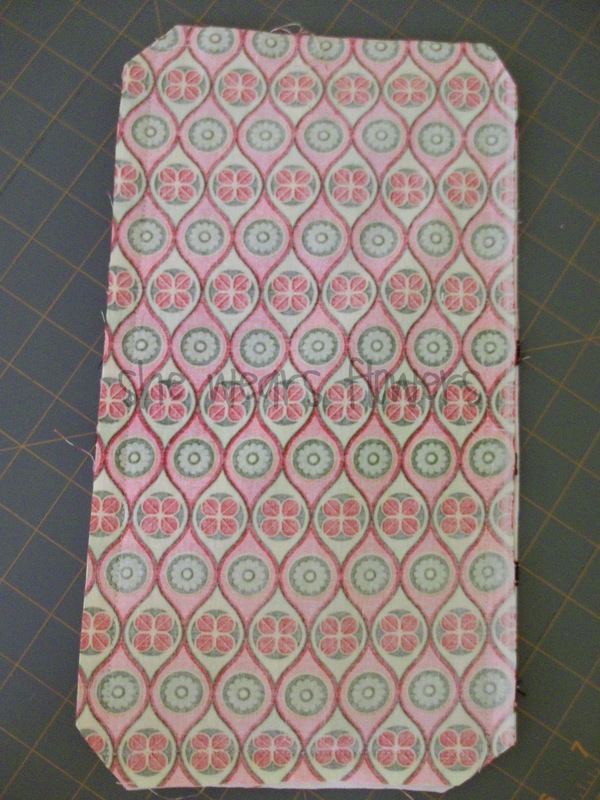 For the interfacing, I used a scrap from another project so I can't remember exactly what it is, but I got it at JoAnn's in the section with all of the interfacing. 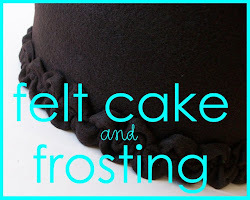 It is really stiff--I used it for the brim of a bonnet if that gives you an idea of how stiff it is. It probably doesn't need to be quite this stiff or thick, but I like the way it worked. 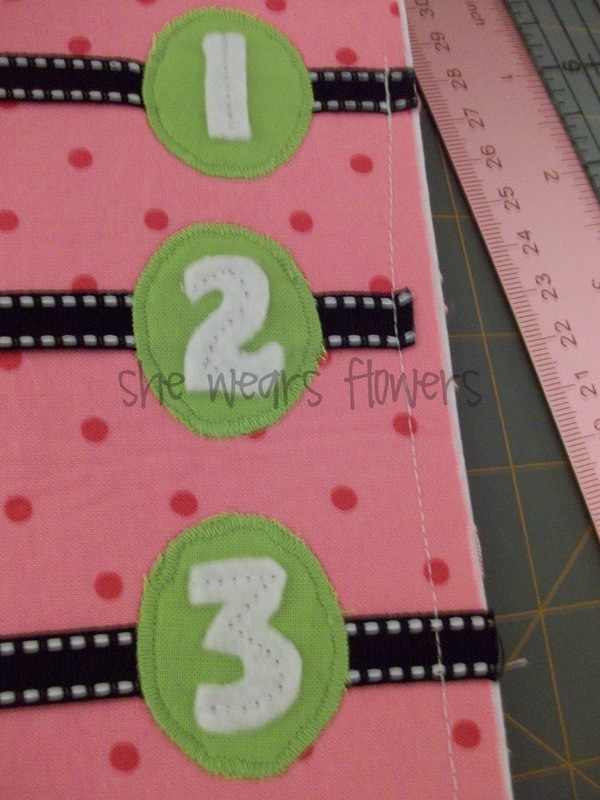 Adhere the interfacing piece to the wrong side of the fabric designated for the inside of your game. ELLIPSE for NUMBERS: Use the pattern to trace 6 small ellipses on HnB. 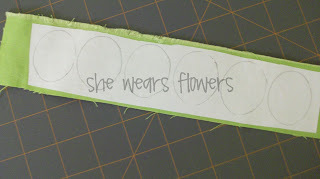 Cut a piece of fabric that is slightly larger than that. 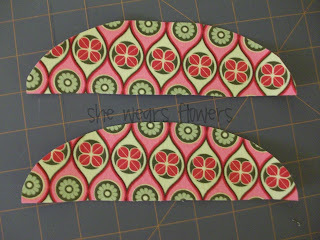 Adhere HnB to fabric and cut out ellipses. Peel off paper backing. Set aside. NUMBERS: Use the pattern to trace the numbers backwards onto the HnB. You can place your pattern underneath the HnB and hold it up to a window to be able to see the numbers through the HnB. Adhere to a small piece of felt. Cut around numbers. Set aside. 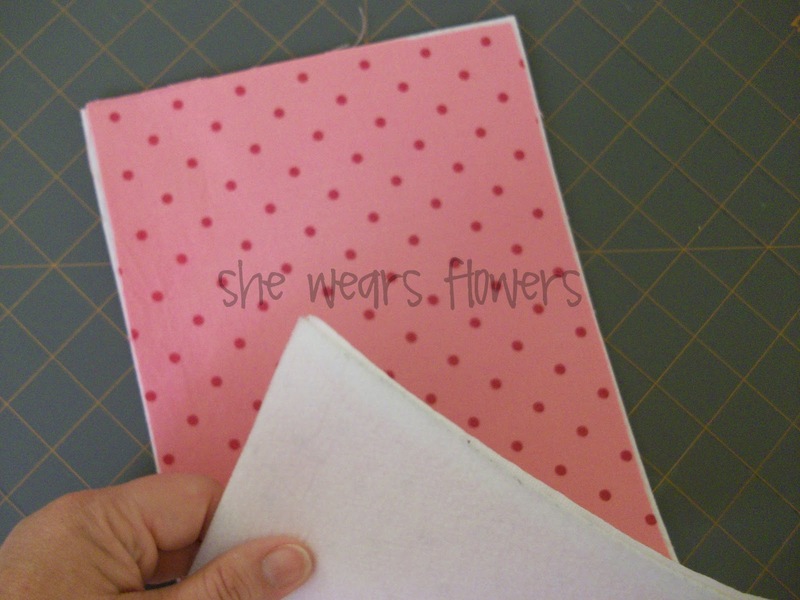 FLAP: Sew Velcro to outside on one side of the flap. I marked the center and then placed it a little below that point. 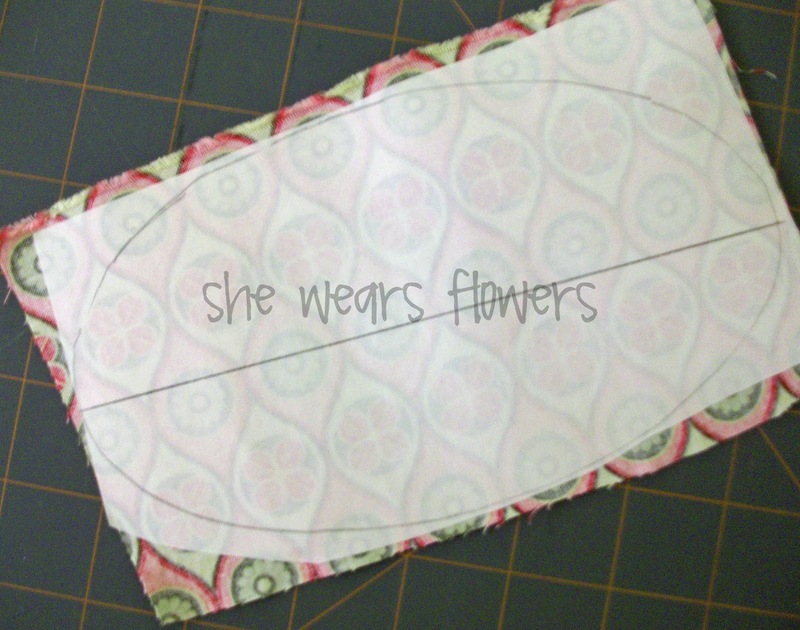 Place the fabric sides of the ellipse together (right sides together) and sew along the outside curve using a 1/2 inch seam. 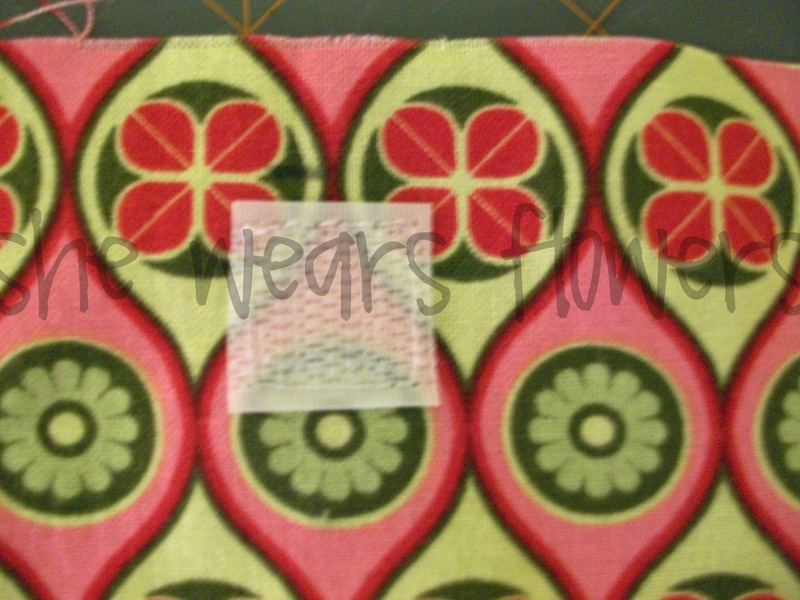 Do not sew the straight edge. 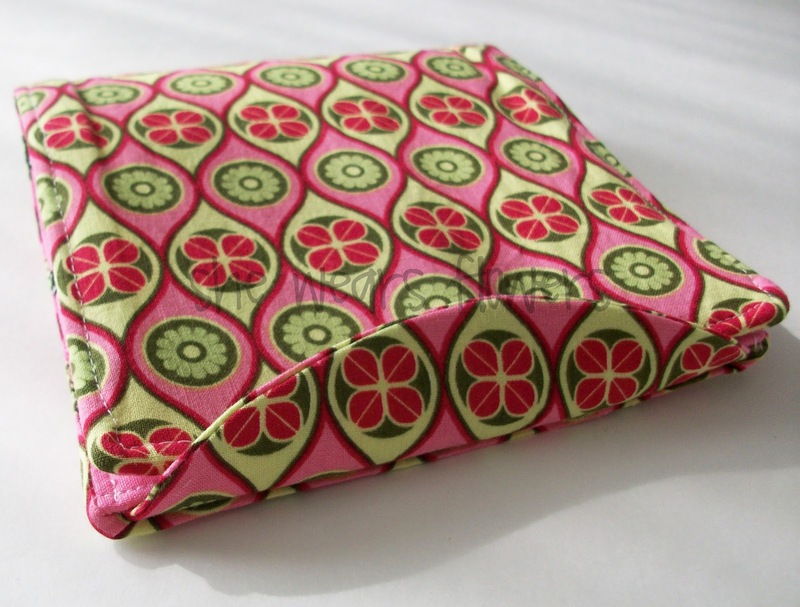 It might be difficult to sew because the Heat N Bond tends to stick to the machine. 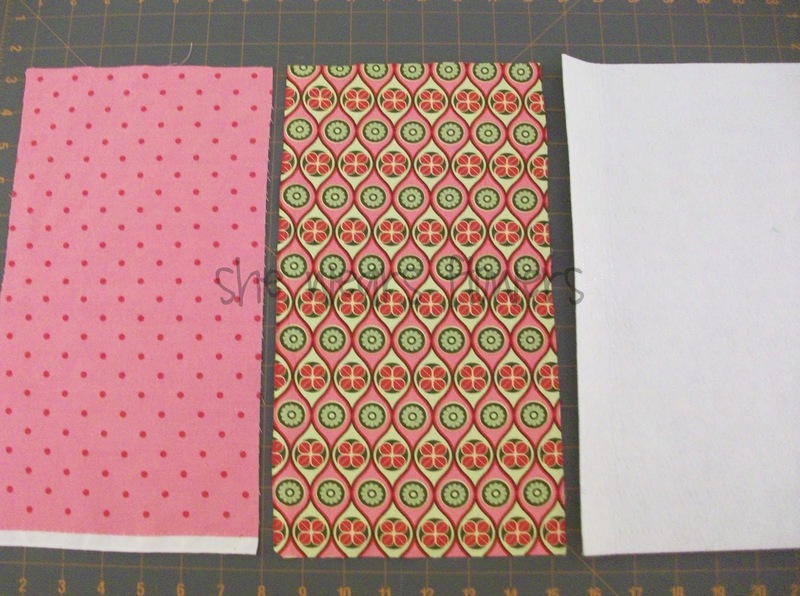 I just added a piece of lightweight fusible (one side) interfacing to the pieces because it is soft and helps the fabric slide through better. Snip along the curve close to the stitching being careful not cut through the stitching. 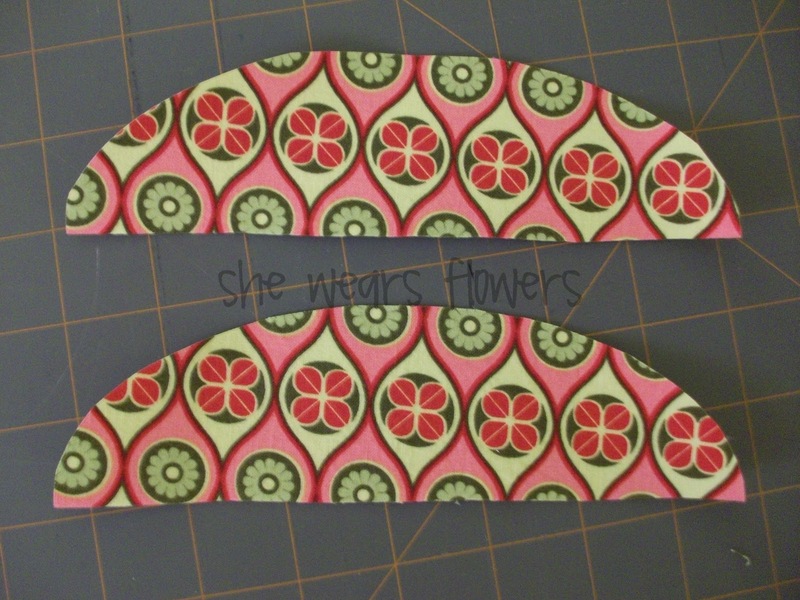 Trim seam allowance down to about 1/4 inch. 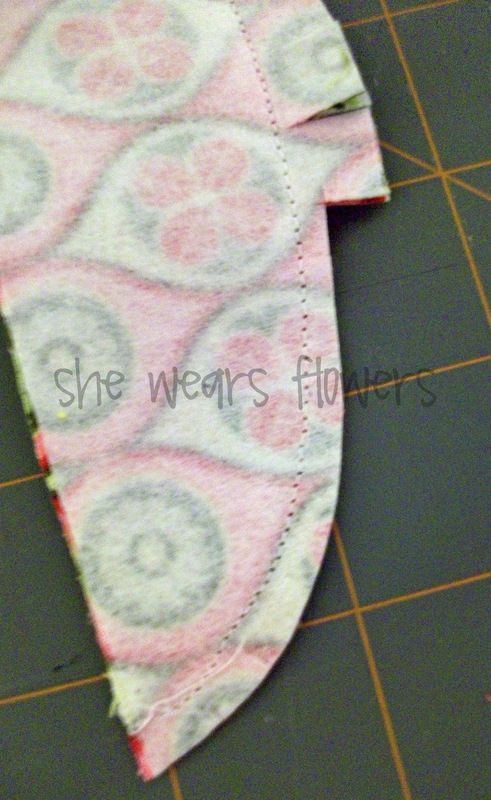 Turn the flap right side out and iron the seam smooth. The Heat N Bond will adhere the two sides together as well, so iron carefully. 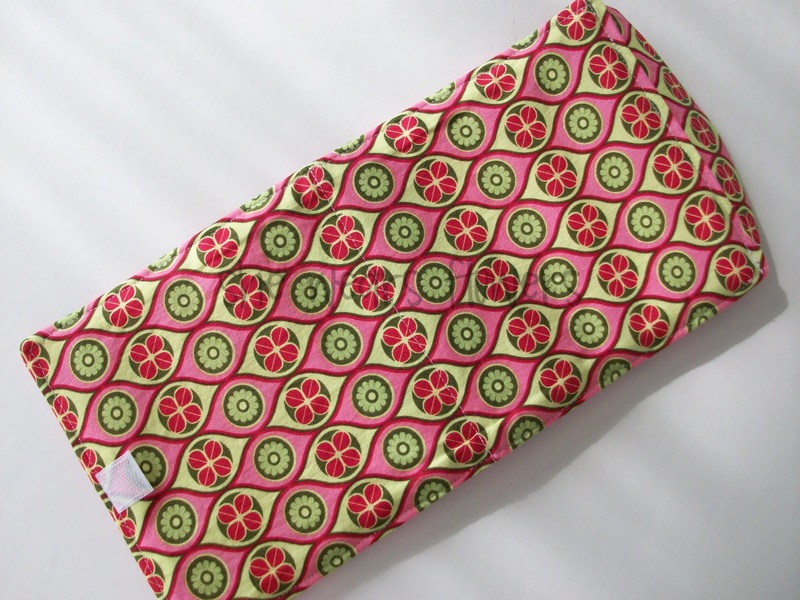 The Heat N Bond will make the flap a little stiffer and more durable. 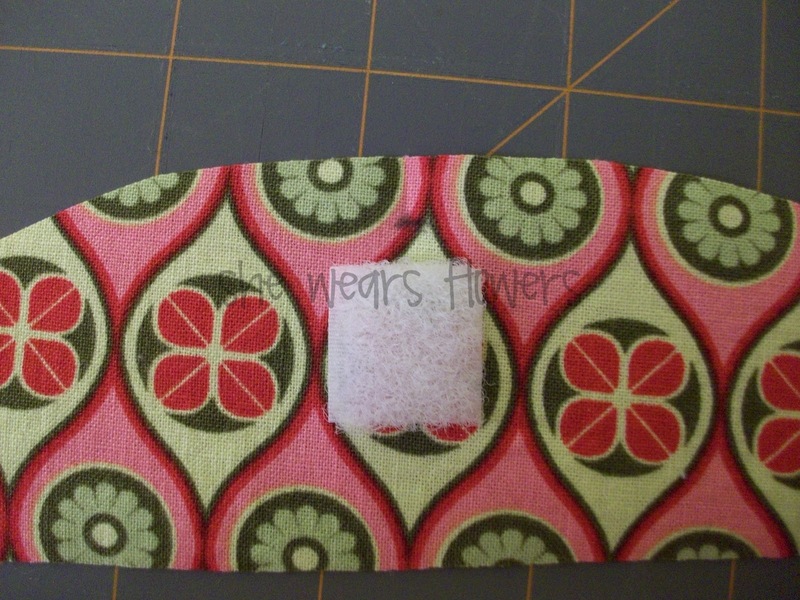 Then, sew the flap closed along the straight edge. Sew close to the edge. Set aside. GAME BOARD: Use a pencil to make a mark 1/2 inch up from the bottom of the game board. Mark again every two inches starting at the first mark. You will have your starting mark and 6 more marks. 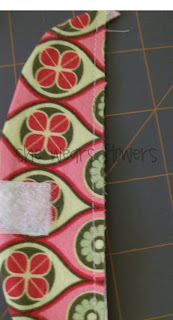 Sew your ribbons on by placing the ribbon at the marking and wrapping about 1/2 inch behind the game board. 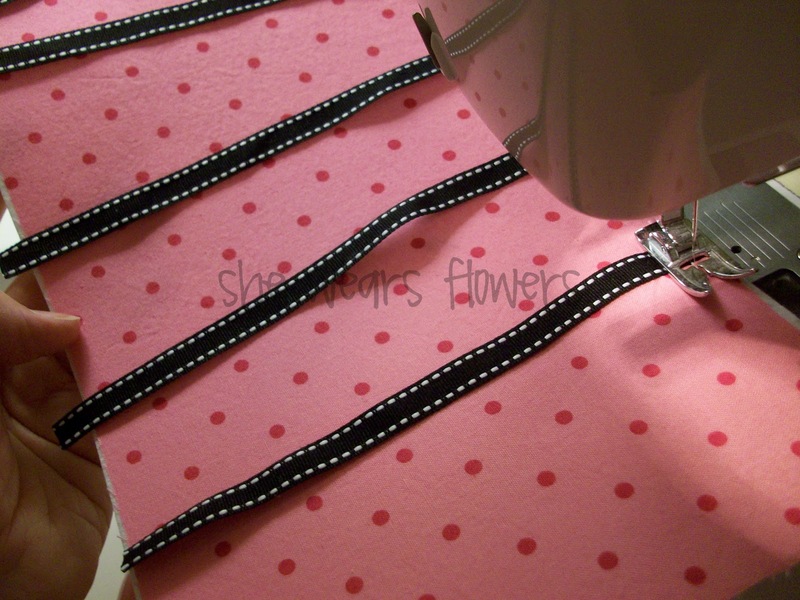 I sewed mine really carefully--going over the stitching line on the ribbon 2 or 3 times. By wrapping it around the game board, I am securing it again. 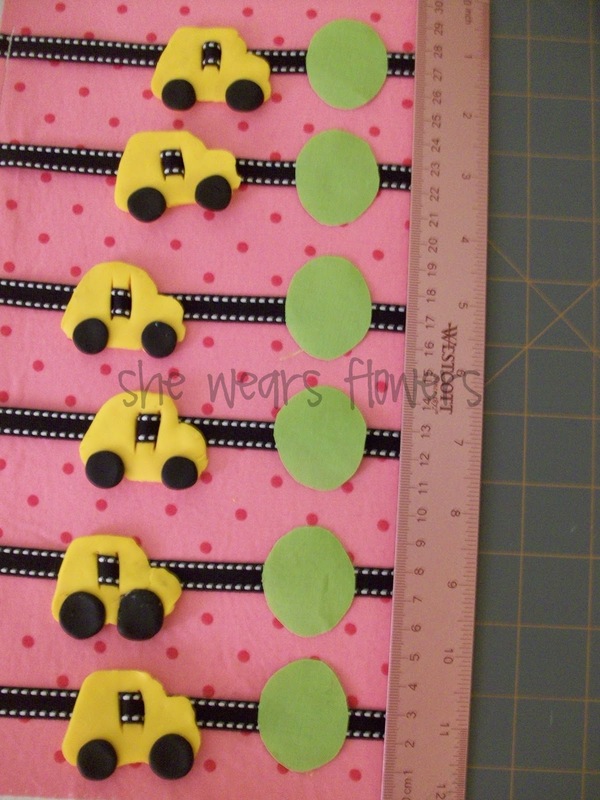 Thread the ribbon through the slits on the cars. 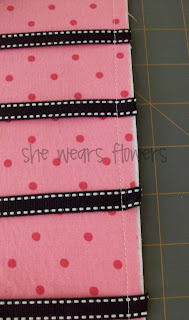 Sew down the right side of the ribbon. I just stretched it taut and eye-balled it to make it level, but you can mark it if you prefer. 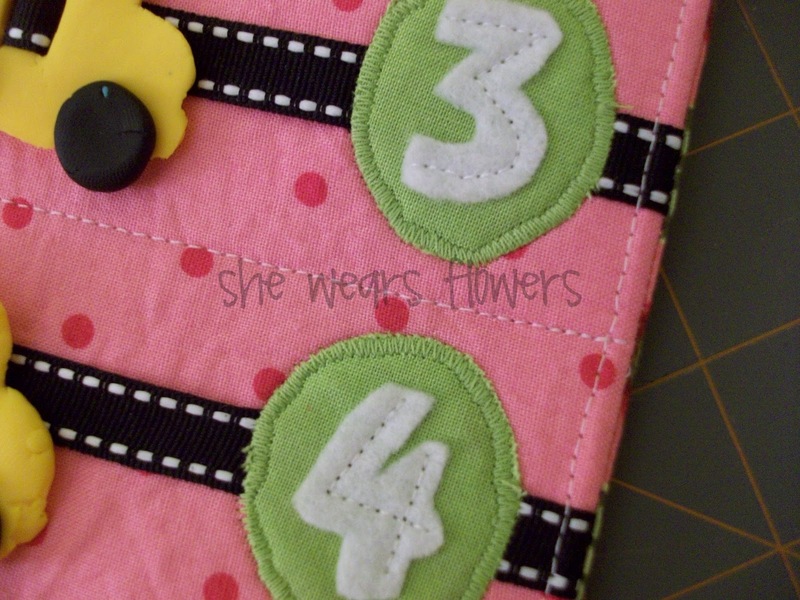 On this side, you only need to sew it down once because the number part will sew over it again and again to help hold it securely. Iron the small ellipses to the game board at the end of the ribbon. 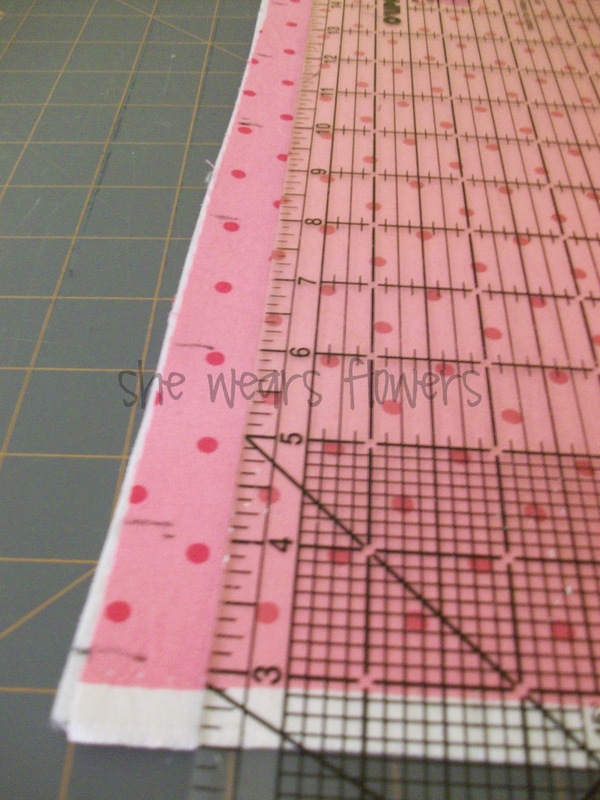 Be sure to leave a space a little more than 1/2 inch from the edge for your seam. Applique using a satin stitch or zigzag stitch around the small ellipses to help hold them securely. This isn't exactly my area of expertise, but it worked out okay--go slowly. 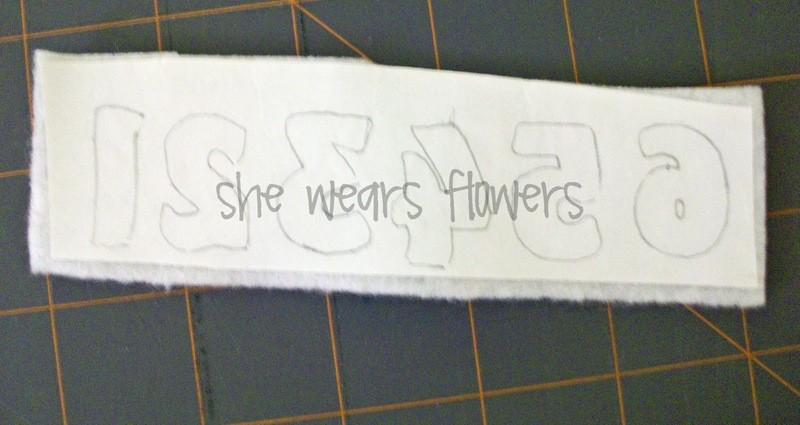 Then, iron on the felt numbers in the center of the ellipses. 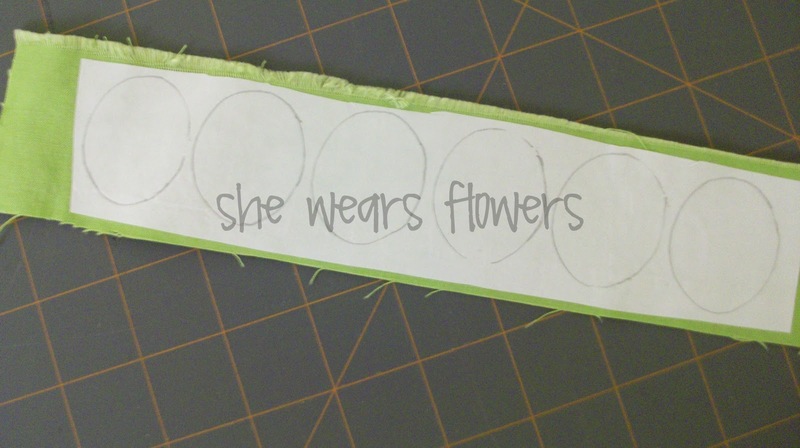 Use a straight stitch to secure these to the ellipses. I just stitched in the middle of each number. 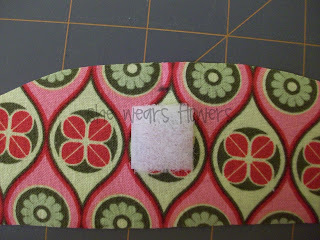 Sew the other half of the Velcro to the bottom of your outside fabric piece. Sew on the right side of the fabric. 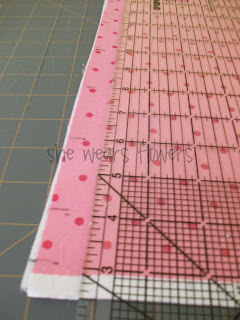 Make a mark 1/2 inch up from the bottom edge and sew close to the mark. Put rights sides together and sew around three sides. 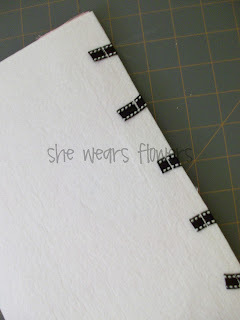 The side you do not sew will be the top of the game board or the short edge that does not have the Velcro attached to it. Trim your corners. 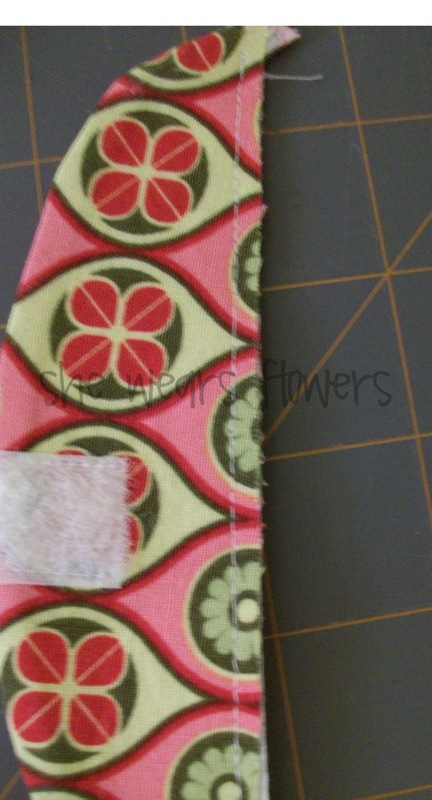 You should also trim your seam allowance to 1/4 inch after checking to make sure you have sewn it properly. I forgot to trim mine and it was fine--just a little thick. Turn your game board right side out. Do this very slowly and carefully since it will be very stiff and it is kind of lumpy and awkward with all of those cars. Be careful you do not bend your cars or they will break! 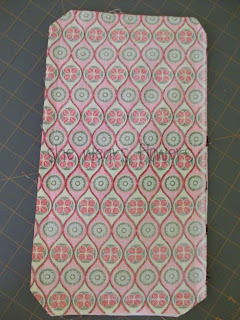 Once it is turned it will sit funny because of that stiff interfacing. Just iron the edges flat being careful not to get near the cars. 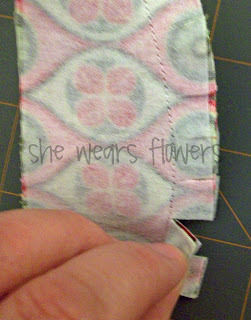 Fold the top edge in 1/2 inch and iron to hold it in place. Slide your flap in place being sure that it is inserted far enough to catch it completely when you sew (about 1/4 inch). The side with the Velcro should be on the same side as the cars. 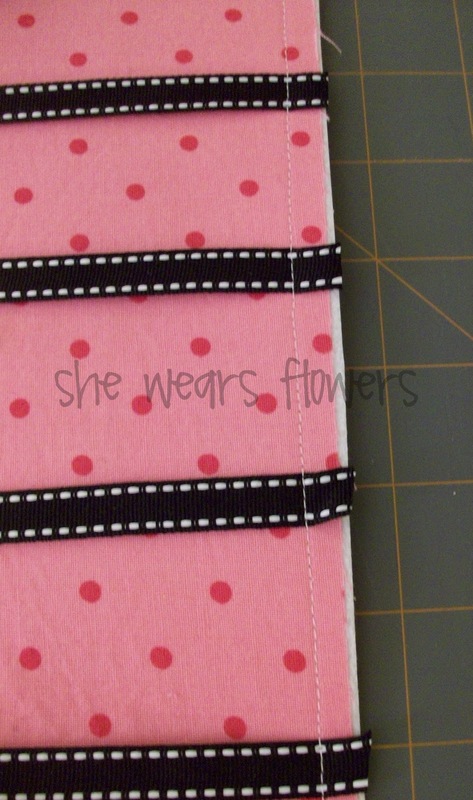 Sew along the edge to secure it using a 1/4 inch seam. 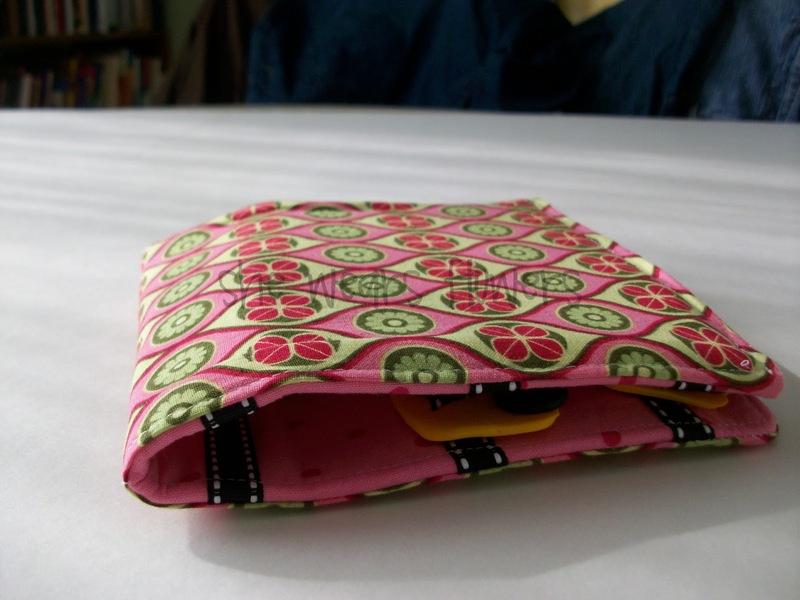 Topstitch along the other sides in the same manner. Sew a straight line across your game board in between the 3rd and 4th rows. You can measure to be sure it is centered. It should be 6 inches from the top and bottom. This will help your game fold over more easily. 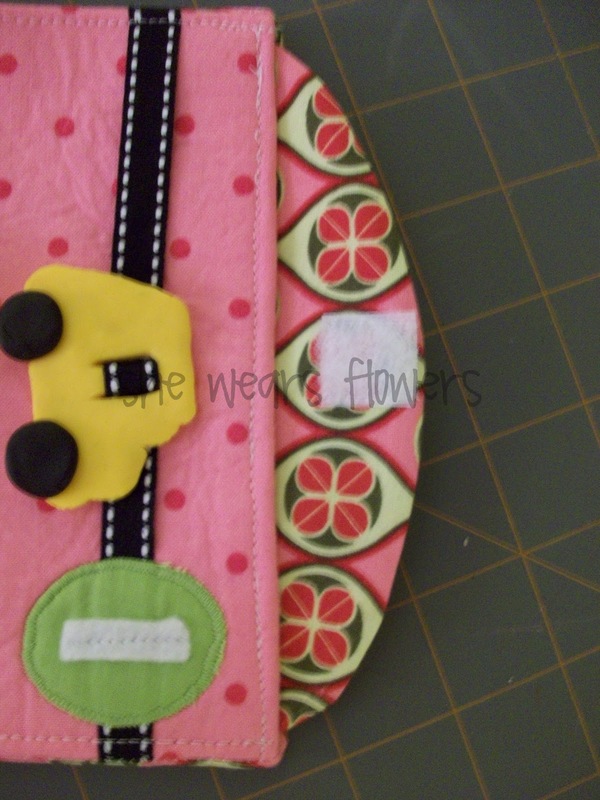 Your game should fold over and can be held together with the Velcro. My flap is a little small (I corrected this for the pattern you are downloading) and I decided I should have added a small handle, but it works! There you go! 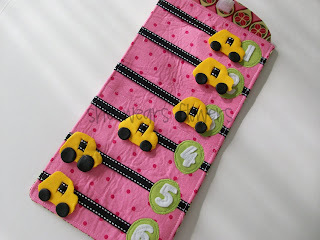 A car game for short car rides because, let's face it, the majority of our car time is spent on frequent, short trips that we make every day. And that's why you need the YELLOW CAR GAME in your car! I am linking HERE this week! And, I entered the challenge at The CSI Project also! Its really nice blog.i really like it and i will do this for my child also.and we play the game on it..
That is very cute! Visiting from Something I Whipped Up Monday. This is so cute and clever!! my oldest boy would love this game!! Thank you for the adorable tutorial. I found you via Skip to My Lou! Ditto to everyone. Wonderful idea Tammy. I want this too. I need more hours in a day so that I can do all of my projects and YOURS TOO! We have just discovered your gorgeous tutorial! We'd love to meet you on our facebook fanpage http://www.facebook.com/STAEDTLER.headquarters - it would be great if you became a fan, too, and showed your artworks on our page. That is so cute. I bet my neice who is almost 2 would just like the cars and numbers even without the game! Thanks for the tutorial! How fun! My brothers and I always count how many houses had Christmas lights during the holidays and we can only look out our window. The person in the middle could pick whichever side. So cool! 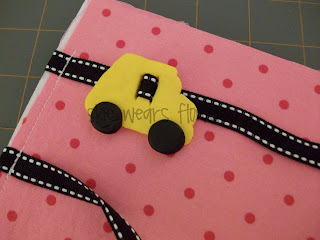 I love, love, love this, and it is making me wonder what else I can do with Fimo! What a great idea, thank you for the inspiration. This is such a fun looking game! 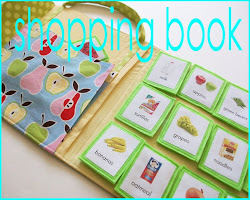 I have added your activity to an upcoming post on homemade learning tools on our blog. We used your top photo, gave a short description, credited you, and provided a direct link back to this post. If you prefer we remove it, let us know and we will. Thank you in advance for sharing with our readers! That is amazing! I love that it's entertaining, but you don't have to chase little pieces that get dropped. This is such a great idea! How fun for the car. Funny thing...my little brother was just telling me about this game in the car today. I've never heard of it before and now I have twice in one day. Very cute! Love the fabrics! Cute idea! We play a version of this game, but we get to pick what color we want... Super cute gameboard. Such a cute idea, and it looks amazing. The colors you chose were great. I wish I had kids! This is a great idea! So cute and yet so easy for little kids. Love it! Wow! That is so cute & a huge help in the car. Great idea! Wow!! That's super cool of you to turn their game into something real! Such a fabulous idea! Wow! That is so neat! Love it! Thank you for linking up, this week, to Anything Related! This is such a cute idea. I'm going to make some for our car rides. What a great game! What a FUN game!! I am doing this when my son is a touch bigger. I may do it with buses, though. ADORABLE! Thanks for sharing! This is GREAT!! Found you through "Whatever Goes Wednesday"! 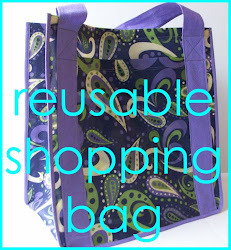 I linked your project under my "Inspirational Projects" section on my blog! This is absolutely adorable! I will definitely try and play with my kids! What a great activity! Just wanted to let you know I featured you on Tot Tuesdays this week! One of my favorite ideas for sure! Thanks for sharing! This is amazing! We are taking a long (4000 mi) road trip soon and I have been looking for fun car trip ideas. This will definately make the to do list. Awesome! Thanks for the great tutorial. I LOVE this!! 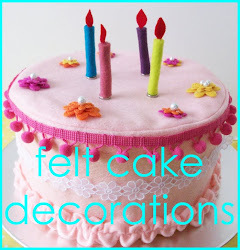 Thanks for linking @Creative Itch's 'Sew Cute Tuesday'! I saw your tute on Not Just a Housewife and I had to make it! You can see mine here. Thanks so much! What a fantastic tutorial!! LOVE this idea! Ha! We play this too! And what a great accessory to make it that much more fun! Thanks for sharing! Nice and very creative! I'm quite sure my kids will really enjoy htis lol! Especially the yellow bus game lol Thanks for sharing! I was just googling the Yellow Car Game and came across your blog. I love your design and a perfect idea to use in the car. My boy loves the came and just like you we had ended in some heated rule discussions in the car. Its a great way to pass a long journey as we can all play - Priceless.